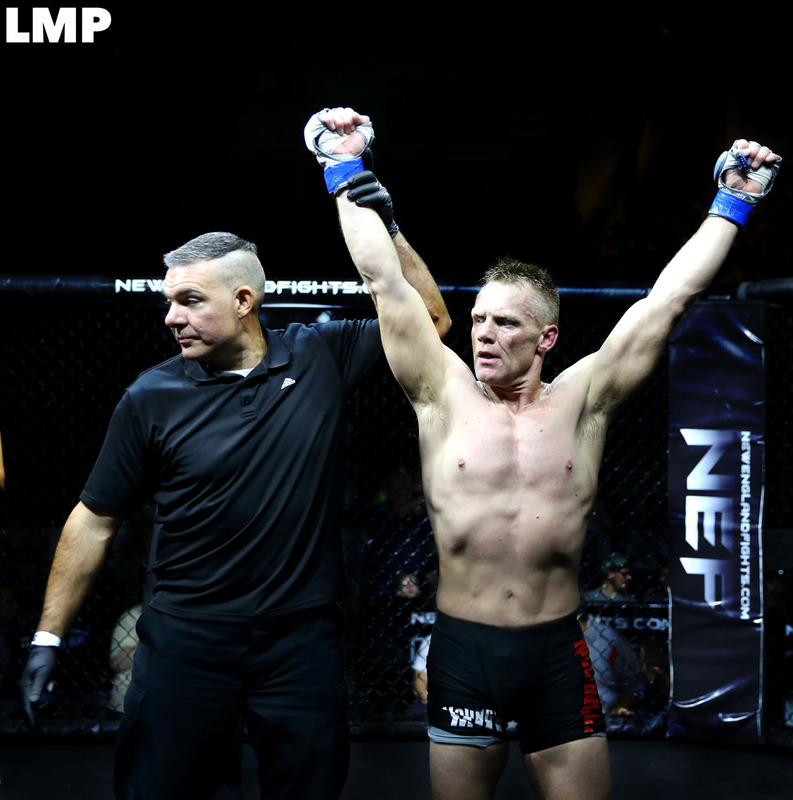 FOR IMMEDIATE RELEASE: Bangor, Maine (August 7, 2018) – New England Fights (NEF) will hold its next mixed-martial-arts event, “NEF 35: Wicked Season,” on September 8 at the Cross Insurance Center in Bangor. Earlier today, the fight promotion announced the addition of an amateur lightweight title fight to the card. Pat Kelly (4-0) is scheduled to defend his strap against the challenge of fellow undefeated MMA competitor Tim Manning (2-0). The fight will be the final contest for the 53-year-old Kelly who began competing in MMA four years ago in his late 40s. He brought to the cage unmatched wrestling credentials earned through a lifetime on the mats. Kelly is nothing short of a legend in Maine wrestling circles. He won a state championship as a senior competing for the former Camden-Rockport High School. Kelly went on to wrestle for the University of Maine where he claimed a New England title and competed in the national NCAA championships. Later, as a coach Kelly would lead Camden-Rockport and Camden Hills Regional High School to multiple state championships. Among the students he coached is current UFC star Tim Boetsch (21-11). Kelly was inducted into the Maine Wrestling Hall of Fame in 2007. For all his accomplishments in wrestling, Kelly’s time in the MMA cage has been impressive as well. He was able to finish his first three bouts on his way to earning a crack at the NEF Amateur Lightweight Championship. Last summer at “NEF 29,” Kelly handed then-undefeated Rafael Velado (4-1), an athlete fourteen years Kelly’s junior, the first loss of his career to claim the belt. Over a year later, Kelly promises to bring his trademark intensity to both his training camp at Young’s MMA and his final fight on September 8. Kelly’s challenger on September 8, Tim Manning, is also undefeated. Fighting out of F2 Arena in Gainesville, Florida, Manning is nicknamed “Murder” for good reason. It took Manning a mere 37-seconds to submit his opponent with an armbar in his amateur debut last fall. He followed up that performance with another impressive first round submission earlier this year in his sophomore cage appearance. NEF’s next mixed-martial-arts event, “NEF 35: Wicked Season,” will see the company make its return to the Cross Insurance Center in Bangor, Maine. The event is scheduled to take place Saturday, September 8, 2018 with a bell time of 7 pm. Tickets are on sale now at www.CrossInsuranceCenter.com.